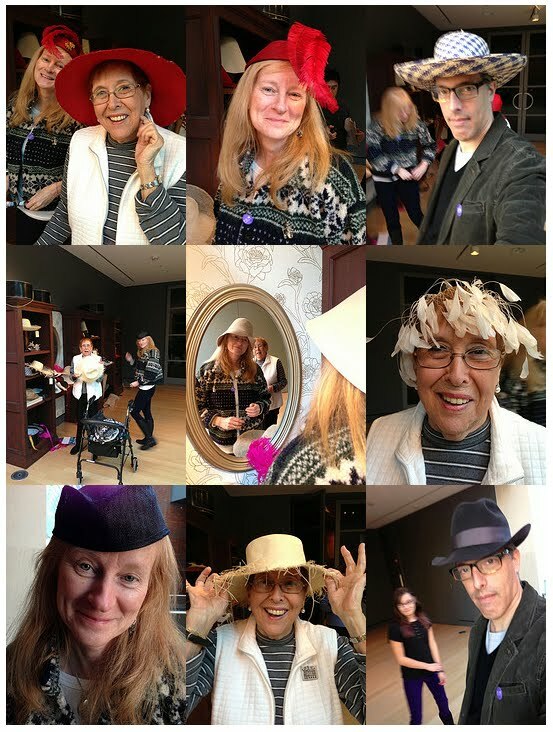 ALL THOSE HATS - WENT TO OUR HEADS! For many years when Hanukkah came around, one of the traditional things my family and I did to celebrate the holiday was to share a meal together and exchange gifts. This season, instead of gift giving, I thought it was time for something different. At this point in time I wondered, "what do you give your children?" Instead of buying something, I had the greatest idea! 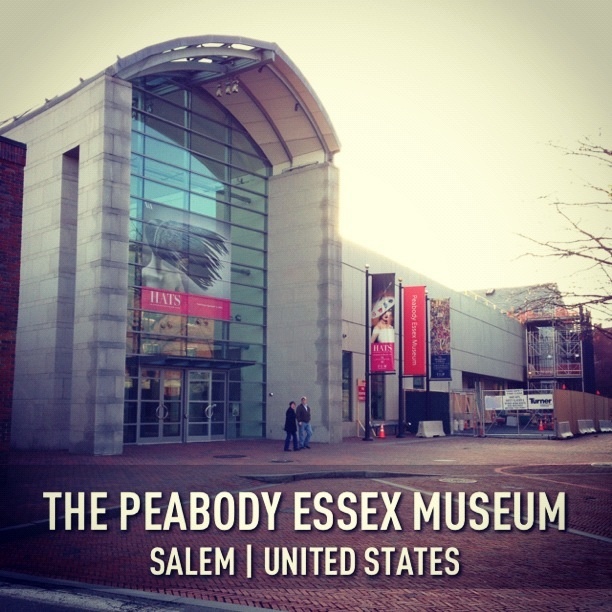 "How about going to the Peabody Essex Museum and seeing their current exhibition - "Hats" and then out to dinner? We spent a wonderful day touring the four sections of the exhibition. Each hat was clearly marked with the date they were created. We had fun trying to guess the date - sometimes we were right, sometimes way off. 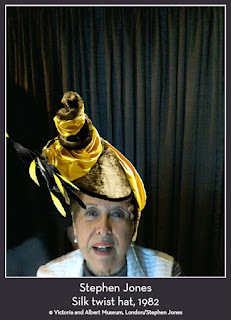 There was one area where the visitors were allowed to TRY ON the hats and take photos. 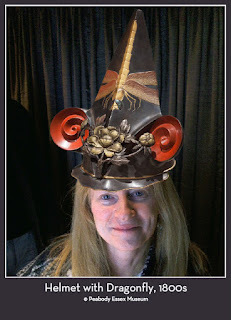 Another area was set up so you could choose a hat on a computer screen, and then place the hat however you pleased on your head and then press a button and get that photo taken. And then, lo and behold the photo was framed and shown on the wall as a piece of art!!?? After all that excitement we went to the gift shop and Steve became the proud owner of a handsome wool hat. Don't you think he looks like a cast member of "Mad Men?" 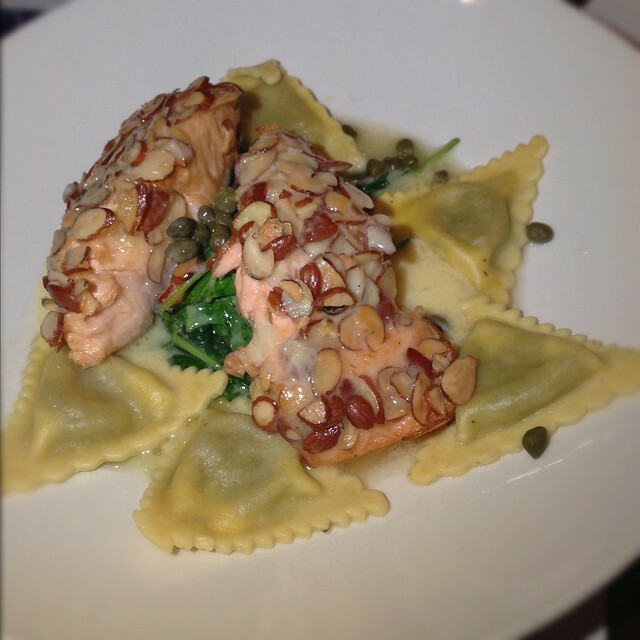 The day wasn't over yet - it was off to dinner at Legal Sea Foods. Food is always good there. What kind of hat do you wear? I only wear one when I really have to - just something to kept the head warm! I wear sun hats, sometimes canvas and sometimes straw depending on whether I am on a boat or on the beach. Nothing as striking as your hats! I LOVE hats, and I used to model them when I was in high school. I think I now own about 12 hats; only one is them is fancy - covered in black sequins and a few whispy feathers. Most are the kind you wear to keep your head warm (or hide messy hair). 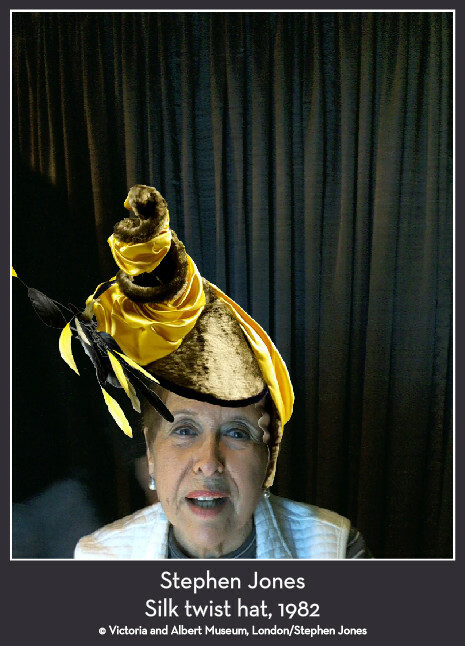 I would love seeing that exhibit and trying on the hats!! You really know how to have fun! I wish I could see that museum. I was at the BATA shoe museum in Toronto once and really liked it. They had quite a collection of Lady Di's size 9 1/2 shoes. She was not petite in the feet. Oh, and I got to go to Legal Seafoods when I was in Boston several years ago and ate my first and last lobster ever! I loved it! I wear caps when out for my walks now, but do remember -- thanks for reminding me -- when I was a teen and wore hats and white gloves to Sunday school and church. Always loved big, wide brimmed ones. I always loved Hats with large,wide brims. 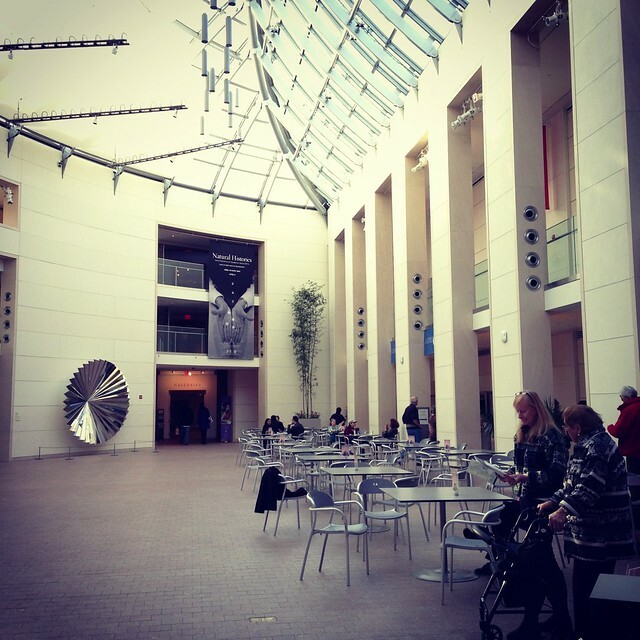 That day at the Peabody Essex museum was a Blast for you and your family. What a great way to make a Magical Memory for the Chanukah Holiday! The fish looked great did it taste as good as it looks? What a great day together .. I wear sun hats in the garden. Maybe a cap when riding tractor. I would love to have visit that hat museum. To be able to try some on must have been an added bonus! Hey! This post couldn't be written any better! Reading this post reminds me of my previous room mate! He always kept talking about this. I will forward this post to him. Fairly certain he will have a good read. Thank you for sharing! I'm thinking that the last time I wore a hat was when I was in a wedding in 1962 - a tiny pillbox. I did own, at that time, a black hat for winter and a white hat for summer - each a small pillbox style. Now, the most I wear (and I wear one whenever outside, to protect my eyes) is a visor. If it's really cold, I will wear ear muffs. BTW: I am not the anonymous spammer with a link to "Christian...."
It has always been a sadness that my head is too big to wear hats you buy over the counter. Even "one size fits all" doesn't fit me. I've heard Oprah has this problem, but she can afford to have her hats specially made! I must say that hats don't suit me. So I never wear one. It might have to do with the fact that when I was little, my mom would always make me wear a hat! So there. But that exhibit looked pretty interesting and I just loved the photos of you, Carol and Steve! I think the last formal hat I wore was in the early sixties for my wedding. Any hats worn since have been strictly for protection of my redhead fair complexion from the sun. 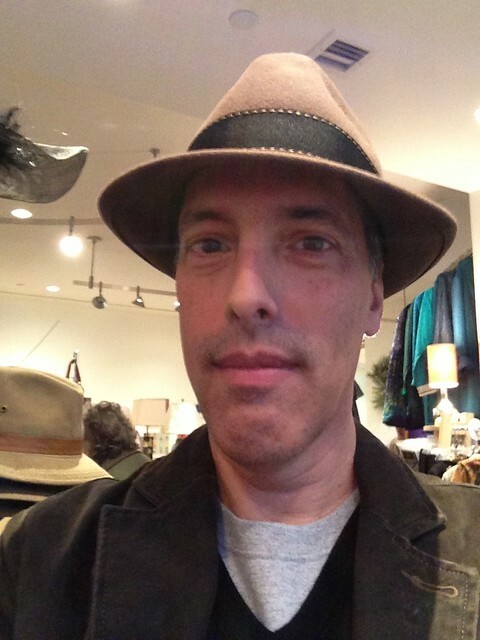 My husband persisted in wearing a hat here in Calif. as we did in the wintery east. In fact, we had gone to great lengths to order and surprise him with a new duplicate of his favored hat for Christmas. He never got to wear it and died suddenly a few months later. I couldn't bring myself to part with the hat and still have it.